Type FZ impeller single-stage pumps are used to pump clean and dirty water, municipal and industrial waste, as well as other liquids, depending on corrosion resistance of materials of which the pump is made. 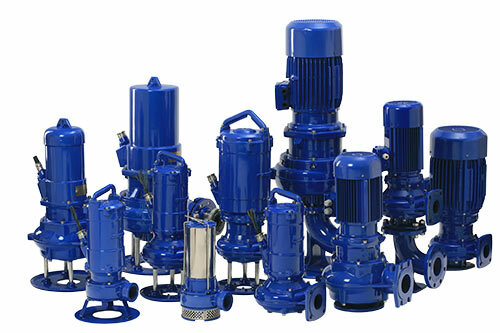 They constitute a highly-unified family of submersible and dry-installed pumps. There are different versions of these pumps, depending on the characteristics of pumped liquids and the type and size of pumped impurities. In particular, they are applied in the pumping of sewage, including sewage with solid and long-fibre content, as well as liquids containing air and gases. They will work very well in pumping of raw sewage containing active sediment, and putrid sewage. FZB Channel impeller pumps for pumping contaminated liquids with solid and sewage content, without fibrous substances. FZC Double-vane (triple-vane for FZ.9) impeller pumps for pumping contaminated liquids, or raw sewage. FZD Grinding impeller pumps for pumping contaminated liquids with solid and sewage content, without fibrous substances. FZE Vortex Special impeller pumps for pumping contaminated liquids, or raw sewage. FZR Multi-vane one-side open impeller pumps equipped with a grinding device for pumping liquids contaminated with long-fibre substances. 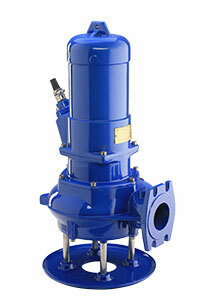 FZV Vortex impeller pumps for pumping contaminated liquids, or raw sewage. FZX Multi-vane one-side open impeller pump equipped with a grinding device for pumping liquids contaminated with long-fibre substances (explosion proof). FZY Multi-vane one-side open impeller pump equipped with a grinding device for pumping liquids contaminated with long-fibre substances. 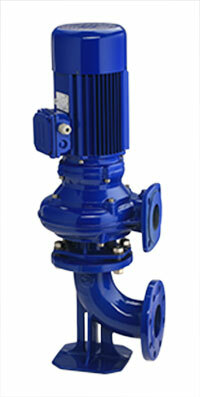 The FZB type pumps are equipped with a closed channel impeller. The pump is used for pumping contaminated liquids with solid and sewage content (e.g. water with sand) and without fibrous substances. less “free” passage as compared to Vortex systems. The pumps of this type are used in sewage pumping stations with seperation of solids manufactured by Hydro-Vacuum SA, but they can also be used for pumping other liquds than preliminarily cleaned sewage. In the standard version (1), the impeller is made of Zl250; and in version 2, the impeller and bearing housing are made of ZbCr32. At the customer’s request, the pumping housing may also be made of ZbCr32 or cast steel. The FZC type pumps are equipped with two-vane (triple-vane for FZ.9) closed impellers and are used for pumping liquids with high solid, long-fibre, and sewage content. The main purpose of these pumps is pumping preliminarily cleaned raw sewage, active sediment, putrid sediment etc. considerably higher efficiency as compared to the pumps with Vortex systems, which results in potentially lower motor power. 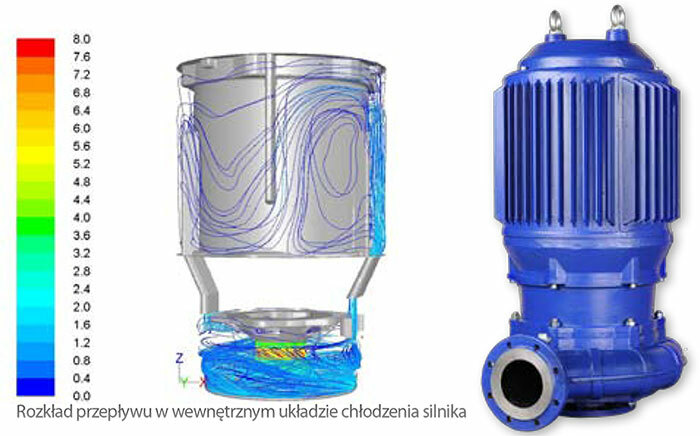 The FZC type pumps may be used interchangeably with Vortex type impellers. 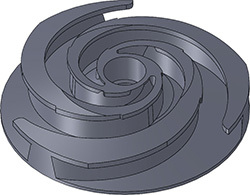 The face disc is not adjustable, the impeller is sealed at the entry on the roller surface and not the face surface; the wear rings are made of ZbCr32; additionally there is a notch at the impeller inlet to prevent sand getting between the impeller and the wear ring, and to protect against locking of the system. 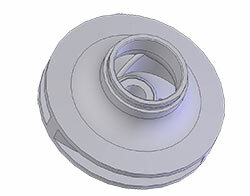 As a standard, the impeller is made of GG25 (version 1), but may also be made of ZbCr32 (version 2). The FZD type pumps are equipped with multi-vane one-side open impellers with a grinding feature, and are used for pumping liquids with long-fibre content. Their main purpose is pumping raw sewage, preliminarily cleaned or not, active sediment, putrid sediment etc. the pumped liquid may not contain solids (e.g. small stones), but the system is not sensitive to rags, unwoven fabric, PET bottles, and similar. The FZD type pumps may be used in all applications where there is a risk of clogging for channel impellers with, for instance, rags; however, due to structural conditions, the pumps must be preceded by a system for separation of larger solid materials. 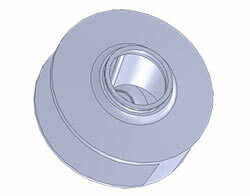 These pumps require adjustment of the grinding disc position, which is done during assembly. The FZD pumps are predominantly used in TSA and TSB sewage pumping stations with seperation of solids. Standard impellers and grinding discs are made of Zl250 (version 1) or the impeller is made of ZbCr32 and the disc of Zl250 (version 2). The FZE type pumps are equipped with multi-vane one-side open Vortex Special impellers, and are used for pumping liquids with high solid, long-fibre, and sewage content. Their main purpose is pumping raw sewage, either preliminarily cleaned or not, active sediment, putrid sediment etc. low sensitivity to rotating system clogging. The FZE type pumps may be used interchangeably with the FZC pumps. The efficiency of the systems is lower than with double-vane impeller pumps, but it is compensated by high motion efficiency of pumps installed in wet sewage and rainwater intermediate pumping stations. The standard impeller is made of Zl250 (version 1), but it may also be made of ZbCr32 (version 2), the same as the oil housing. On request, the pumping housing may also be made of ZbCr32 or cast steel. The FZR type pumps are equipped with a multi-vane one-side open impeller. The pump is equipped with a grinding device for pumping liquids contaminated with long-fibre content, which, if conventional hydraulics were used, would cause the pump to lock. The FZR type pump has no built-in motor safety devices. The drive motor in the FZR pumps is "wet" – it is filled with white mineral oil according to the PN-60/M-96105 standard. The pump is only available as FZR.1. 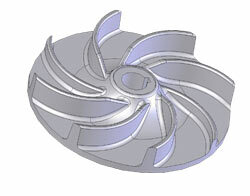 As a standard, in version 1, the impeller is made of Zl250, and in version 2, the impeller is made of ZbCr32. In both versions, the knife and disc are made of ZbCr32. The FZV type pumps are equipped with multi-vane one-side open Vortex impellers, and are used for pumping liquids with high solid, long-fibre, and sewage content. Their main purpose is pumping raw sewage, either preliminarily cleaned or not, active sediment, putrid sediment etc. The FZV type pumps may be used interchangeably with the FZC pumps. The efficiency of the systems is lower than with double-vane impeller pumps, but it is compensated by high motion efficiency of pumps installed in wet sewage and rainwater intermediate pumping stations. The FZX type pumps are equipped with multi-vane one-side open impeller. The pump is equipped with a grinding device to prevent pumping of liquids contaminated with long-fibre content, which, if conventional hydraulics were used, would cause the pump to lock. The FZX pump may be used in explosion hazard areas. It is equipped with a thermal safety device for the motor winding and a safety device to protect against moistening of the motor chamber. 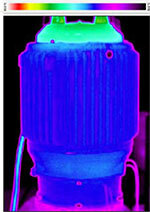 These pumps are available only in the submersible version. The drive motor in the FZX pumps is "dry". It is only available as FZX.1. pumping of sewage from rooms not having sufficient ventilation. 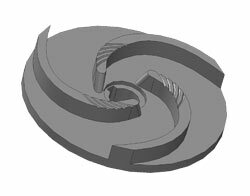 The FZY type pumps are equipped with a multi-vane one-side open impeller. The pump is equipped with a grinding device to enable pumping of liquids contaminated with long-fibre content, which, if conventional hydraulics were used, would cause the pump to lock. The FZY pumps are not equipped with a thermal safety device for the motor winding and a safety device to protect against moistening of the motor chamber. The FZY pump may be equipped with the same set of sensors as the FZX type, but this is nonstandard equipment. These pumps are available only in the submersible version. The drive motor in the FZY pumps is “dry”. The pump is only available as FZY.1. pumping out substances from holding tanks. sewage pumping stations with seperation of solids. the pressure in the cooling system is low, regardless of pump parameters, which reduces the risk of system unsealing. conventional intermediate pumping stations for sewage, rainwater etc. oil chamber moisture sensor (option).